So, we reached out to some of our talented and experienced chefs and asked them to share their advice for making healthy food choices this month and beyond. Today’s chef is Chef Kiril Gallovitch. Chef Gallovitch is Miami University’s corporate executive chef, overseeing the culinary side of dining operations, including the planning of menus, production and more. Chef Gallovitch, a native of Bulgaria with classical European culinary training, has many years of experience working in different kitchens with different chefs throughout his professional career. I have been a chef for the last 20 years. I have extensive experience working with different chefs from all over the world. I started my career working for Sheraton Hotels in Europe. I also worked in a major strip resort in Las Vegas for 12 years. I’ve also been an executive chef of an upscale steakhouse, district chef for a large university for 10 years, and a regional chef for a company responsible for running events around the country and Canada. 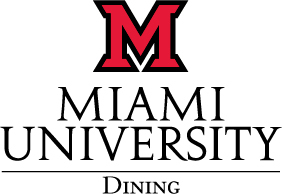 I am the corporate executive chef of Miami University. I am responsible for all of the dining facilities, chefs, Catering, and Concessions. My job is to oversee the operations, and provide guidance, planning menus, production, and special events. Q: The theme for National Nutrition Month this year is “Put Your Best Fork Forward” to emphasize that each of us holds the tool to make healthier food choices. What does this theme mean to you and in what ways do you believe people can make healthy changes to their diets during National Nutrition Month and beyond? To eat healthy starts with the choice of ingredients for the recipes. Focusing on things likes high quality ingredients, freshness, and local sourcing can greatly improve the nutrition content of the foods we consume. Balanced diet greatly depends on the choices each individual makes and making small changes to your diet can add up over time. Choosing the right nutrient-rich food can greatly improve our health and energy levels during our daily activities. Q: In what ways do you think students at Miami can “Put their best fork forward”? My suggestions for a healthy diet would be eating more of the following foods: vegetables, fruits, low fat dairy, whole grain foods, lean meats, legumes, and using high quality oils while preparing your food.